Afghanistan, 2008. After their eighteen-month epic tour of Helmand Province, the troops of 3 Para are back. This time, the weight of experience weighs heavily on their shoulders. In April 2006 the elite 3 Para Battle Group was despatched to Helmand Province, Afghanistan, on a tour that has become a legend. All that summer the Paras were subjected to relentless Taliban attacks in one of the most gruelling campaigns fought by British troops in modern times. 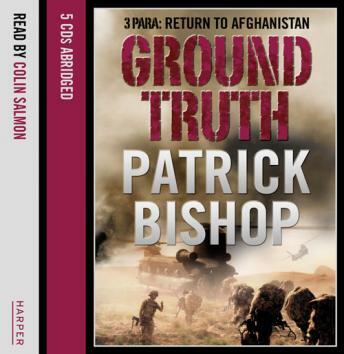 In this searing account of 3 Para's return, bestselling author Patrick Bishop combines gripping, first-person accounts of front-line action with an unflinching look at the hard realities of our involvement in Afghanistan. Writing from a position of exclusive access alongside the Paras, he reveals the 'ground truth' of the mission our soldiers have been given. It's a sombre picture. But shining out from it are stories of courage, comradeship and humour, as well as a gripping account of an epic humanitarian operation through Taliban-infested country to deliver a vitally needed turbine to the Kajaki Dam. Frank, action-packed and absorbing, 'Ground Truth' is a timely and important book that will set the agenda for discussion of the Afghan conflict for years to come.